The U.S. Olympic goaltending race is starting to get interesting with Jonathan Quick playing some of his best hockey in the month of January. Who knows how much he or Ryan Miller will play at this point, but we know that Team USA’s top two goaltenders are going to be looking pretty sharp. 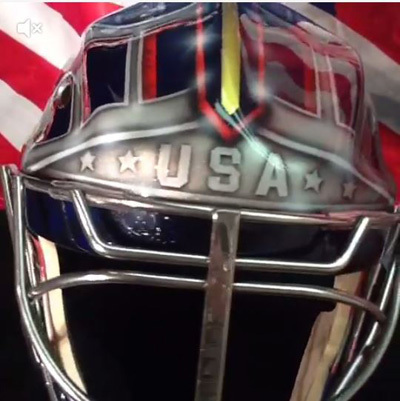 Ryan Miller already debuted his mask for Sochi, which is an awesomely updated version of his 2010 mask. 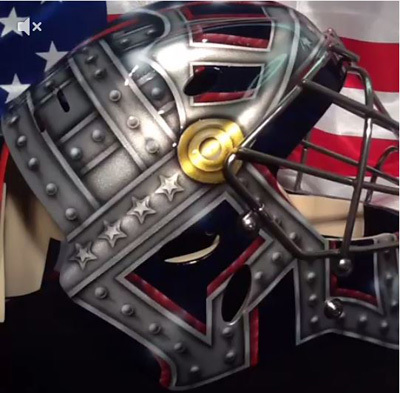 Now we have a look at Quick’s completed mask. His designer, Steve Nash of EyeCandyAir offered a brief look via Vine, which you can see here (since for some reason I can’t embed Vines yet on this here blog). To give you a longer look, I took a few screen caps. Here’s the top of the mask. 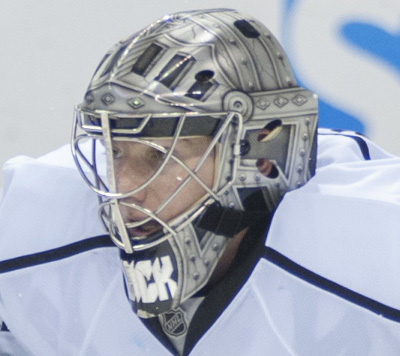 Quick is keeping with the theme of his current armored mask with the Kings, which is a design style he’s used for years in LA. With the blue background and red and gold accents, this Olympic mask offers some subtle differences from what he wears in LA to America it up a bit. Then of course, there’s the USA right in the middle. Here’s a look at the side. He has the stars in the middle there, which is a slight difference from the diamond pattern currently employed in that spot on his LA mask. The gold near the cage is a nice touch. Here’s a slight similarity between Quick’s and Miller’s mask. They both have the USA shield on the chin guard. That logo really is a perfect fit there and it is encased in the steel armor, in keeping with the mask’s theme. Normally, Quick’s mask has his name on the chin. Here’s a look at his current lid for reference. UPDATE: There’s a new addition to the mask that is worth taking a peek at. 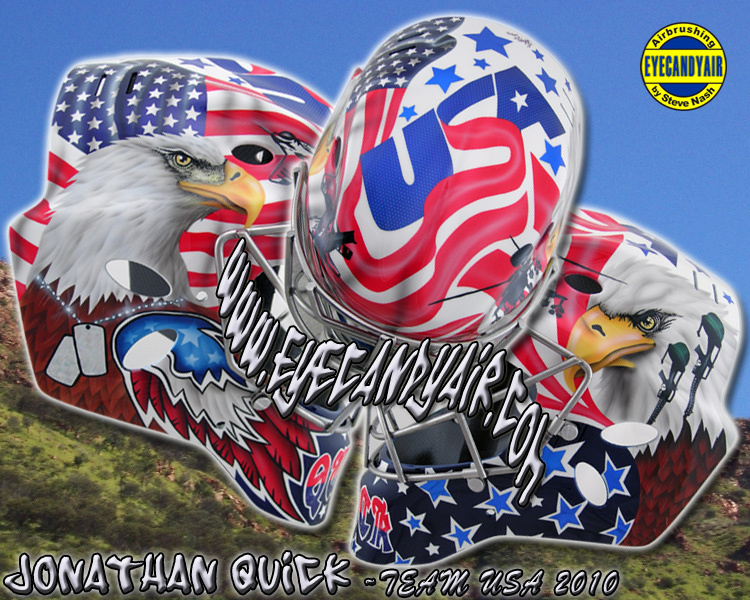 Quick very much wanted to honor the troops with his 2010 mask that he never ended up getting a chance to wear. He will do so with his 2014 mask on his backplate. 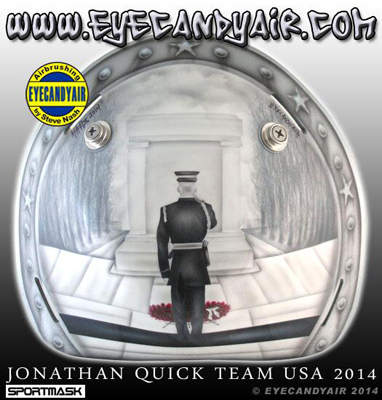 Steve Nash, who designed the mask, painted a beautiful tribute to fallen soldiers. The artwork depicts an officer laying a wreath at the base of the Tomb of the Unknowns at Arlington National Cemetery. It is mostly black and white, save for the red wreath. It is extremely well done. It also doesn’t include the language the IOC seems so antsy about, so they shouldn’t have a problem with this nice artwork. Quick obviously will hope to get to wear his mask this time around. He was on the 2010 U.S. Olympic Team but never dressed. He should see at least some time this year. 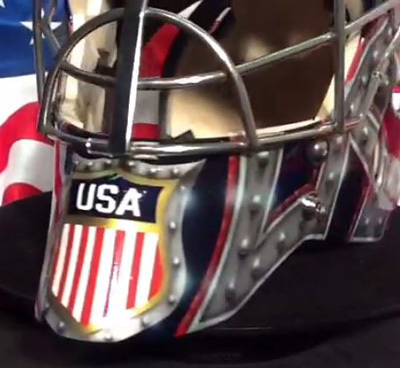 Maybe it’s because the IOC quashed the last mask or maybe he’s just more comfortable with his armor design, but this year’s mask is quite a departure from what he was going for in 2010, which included a “Support Our Troops” back plate. The IOC deemed that quotation as political propaganda, which meant he had to cover that as well. It’s hard to imagine the IOC will have any problem with his 2014 mask, as it is certainly a more understated look. It’s actually quite cool in its simplicity, though. Quick also gets to keep some of his individuality by sticking with what has kind of become his trademark design, with a few Americanized alterations. All photos via EyeCandyAir. You can check out their website here. They’re also on Twitter here. I’ll be sure to update when full photos become available. Looks pretty neat, nobody’s ever explained to me why the IOC bans USA Hockey and Hockey Canada from using their awesome logos on jerseys/helmets, do you happen to know the reasoning behind that rule? The reason they do it is because the IOC views the waving S logo as USA Hockey’s corporate mark, which it actually isn’t. The corporate mark is the arc and star that you see on everything but the jerseys when it comes to USA Hockey. Unfortunately the IOC sees it as close enough. Therefore USA Hockey and Hockey Canada had to replace their normal logos with basically whatever Nike comes up with.